Mystery Star is a great game, brought to you by NovomaticCasino.co.uk. It’s a classic and simple, old-school style slot game with 5 reels and 5 payline and no over-complicated features, which is exactly why it’s perfect for beginners. Having said that, slots aficionados will definitely enjoy getting back to basics with this slot game. All of the typical slot symbols are there, as well as familiar features. There’s nothing fussy about this game which is why we like it. Who needs over-complications when you’re just looking for something lucrative and entertaining? Simple is sometimes best! This slot game is packed full of old-school slot symbols from way back when. The first slot machine was invented in the late 1800s and it’s great to see some of the classic symbols are still popular and gracing the reels in online slots today! Mystery Star boasts all sorts of familiar symbols, such as: cherries, oranges, lemons, plums and watermelons, as well as the red seven, the golden bell and the golden star. Like many other slot games, the aim of the game is to spin at least two or three matching symbols (depending on the symbol), on a winline, in consecutive reels from left to right. 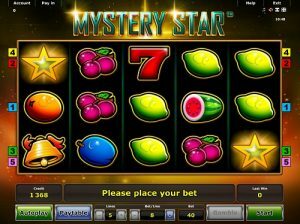 Mystery Star is home to all of the features which have come to be favourites amongst almost every player. Each time you spin a winning combination in Mystery Star, you’ll have the opportunity to gamble it. All you have to do is have enough courage to click ‘gamble’ instead of ‘collect’ and choose between red and black. You’re guessing the colour of the next card – get it correct and you’ll double your win, with the chance to do so again and again, but get it wrong and you’ll lose your win and be back to the reels with nothing. You can check how much each winning combination of symbols will pay you by looking at the paytable – but remember the numbers depend on your bet amount. This is displayed for you at the bottom of your screen, along with your balance and your last win amount, and you can change it whenever you like by using the plus and minus symbols to either increase or decrease the amount you’re betting on each winline. Autoplay and Mystery Star Bonuses! Just as with most other NovomaticCasino.co.uk games, you can play Mystery Star for free until you’re ready to play for and win real money. Once you think you’ve got the hang of the game, you can put it into ‘autoplay’ mode and let the reels spin themselves without you having to lift a finger! Do keep in mind though that you won’t be able to change your bet amount or gamble your wins whilst playing in ‘autoplay’ mode. Mystery Star would not be living up to its name if it did not have mystery stars gracing the reels, but fear not – you will not be disappointed. Whenever three or more golden stars fall on the reels (they don’t have to land in a winning combination or on consecutive reels), you will be rewarded with a mystery bonus! These mysterious golden stars will reveal the amount and it will be added to your balance. Just to let you know, when you spin 5 mystery golden stars, you could win up to 1000x your bet! Here at NovomaticCasino.co.uk, alongside our extensive range of slots and video slots, we also have some fantastic table games and live dealer games. Our live dealer games allow our players to play at real tables, with real dealers – all from the comfort of their own home! Try one out today – you can choose between: Live Baccarat, Live Blackjack, Live Poker and Live Roulette.